I know it’s not an original consideration, that music and cooking share some common threads. Improvisation, playing around, just making stuff up. Being free with the art form. There’s a lot of that in both camps. And both also rely on building blocks, foundational skills that you need to master (or at least accomplish with some degree of proficiency) to move incrementally into more advanced expressions of the art. Sitting down at the piano with not the least bit of practice, or understanding of scales and harmonics, and trying to jam like Oscar Peterson will be a discordant mess. Same would be true of hitting the kitchen without understanding of basic techniques, cooking methods and how different ingredients coalesce when cooked together. Unappetizing chaos more likely the result than something delicious. Which, on the flip side, makes walking into a kitchen WITH those basic techniques and cooking experiences under your belt such an incredible joy. Creating meals based simply on what I have on hand, no premeditation, a trip to the garden for herbs, checking the pantry, what’s in the fridge? Not that I don’t love recipes, they’re my livelihood, but 99% of the time when I’m not in work mode, I cook off the cuff. My nightly kitchen jam session. As much as I loved cooking as a kid, I did also love music. I took piano lessons through all my school years, annual recitals, the whole nine yards. I even accompanied the jazz choir in high school for a couple of years, which was extraordinary fun. We even won the state championship one year! The jazz setting suited me much better than classical pieces. But I had no natural talent for the lively finger-play of jazz piano, no instinct for musical improvisation. I rarely sit down to play these days, and when I do it’s with reliance on the notes on the page to tell me what to do. Without sheet music, I’m lost. Which I realize is how many feel in the kitchen. Without the words on the recipe page to tell them what ingredients to gather and what exactly to do with them, they’d be unable to pull something homemade out of the oven to serve their family. These folks I think about all the time as I’m writing recipes, intent on assuring cooks of pretty much any skill level a sense of success and gratification with something delicious to show for their effort. As I might feel after playing a song on the piano. So, in my heart of hearts I’m a frustrated jazz pianist. Perhaps all these years I’ve been making up for it in the kitchen, riffing and playing around and following my random inspirations wherever they take me. Thanks to culinary school and so many years of practice, I’ve got a much stronger foundational base than I ever had with music. And every time I’m in the kitchen I value the freedom it gives me to just make good food without following a specific plan or formula. I guess that’s my jazz. Soufflé brought me to this subject after a quick post last week showing our dinner soufflé just ready to come from the oven. 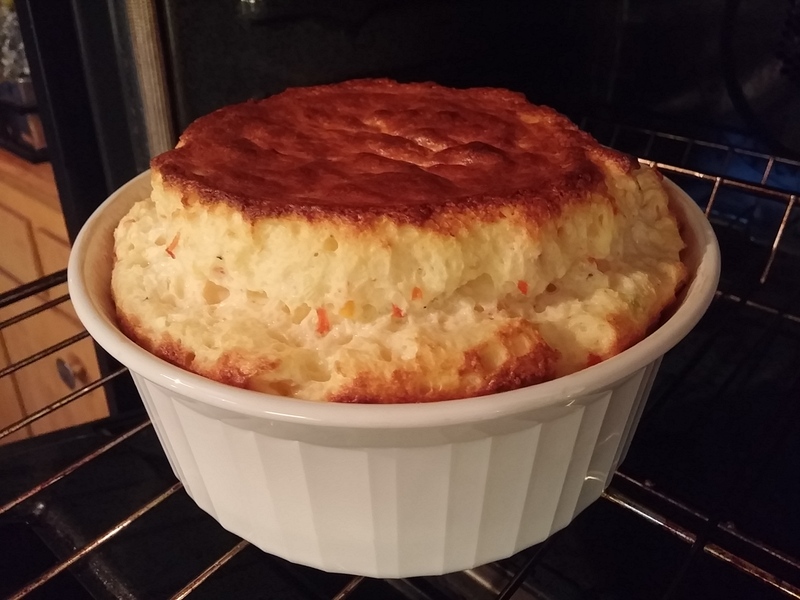 I love soufflé, it’s easier to make than many think, it can usually be made with things you have on handy already, and it adds definite panache to an otherwise basic Tuesday night didn’t-feel-like-going-to-the-store dinner. A friend online asked for the recipe, to which I had to say “sorry, didn’t use one,” but proceeded to explain in a few sentences what I’d done. Preheat the oven to 400 F. Generously butter a medium soufflé dish. Heat the milk in a small saucepan just to the point that it begins to steam. Melt the butter in a medium, heavy saucepan over medium heat. When melted, add the flour and stir well with a whisk to blend. Cook until the flour bubbles for about 1 minute but doesn’t brown; reduce the heat if needed. Take the pan from the heat and slowly pour in the warm milk, whisking constantly. Set the pan back over medium-low heat and cook, whisking constantly until smooth and thickened, 2 to 3 minutes. Whisk in the salt and pepper. Transfer the soufflé base to a large bowl, stir in the cheese and set aside to cool to room temperature. In the bowl of a mixer fitted with the whip attachment, beat the egg whites until quite light, fluffy and moderately firm. Add about one-quarter of the egg whites to the soufflé base and quickly fold them together. Fold in the remaining egg whites in two batches. Spoon the soufflé mixture into the prepared dish, smoothing the top. Bake the soufflé until well puffed, nicely browned and no longer jiggly in the center, about 30 minutes. Serve immediately, using two large spoons to scoop the soufflé onto individual plates.